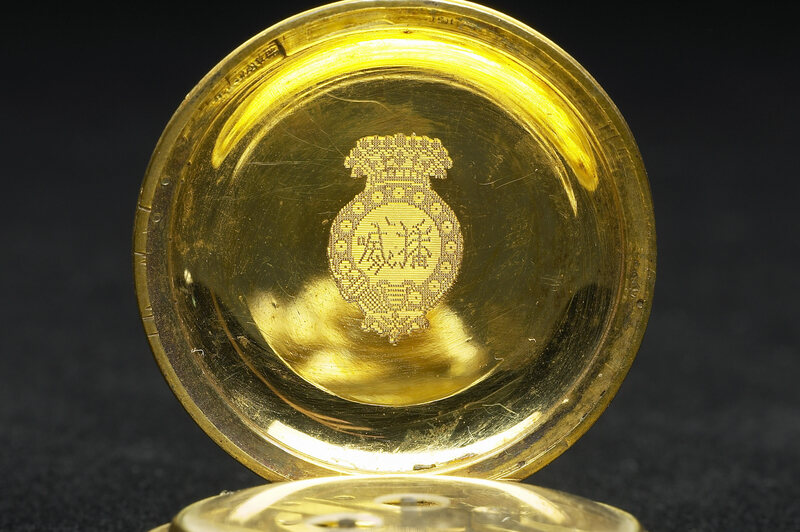 Ever since they were brought to China during the Ming and Qing eras, western clocks and watches were held in high esteem and much beloved by the imperial court, government officials, and merchant class, and they eventually became an important medium for cultural interaction between China and the west during the modern era. 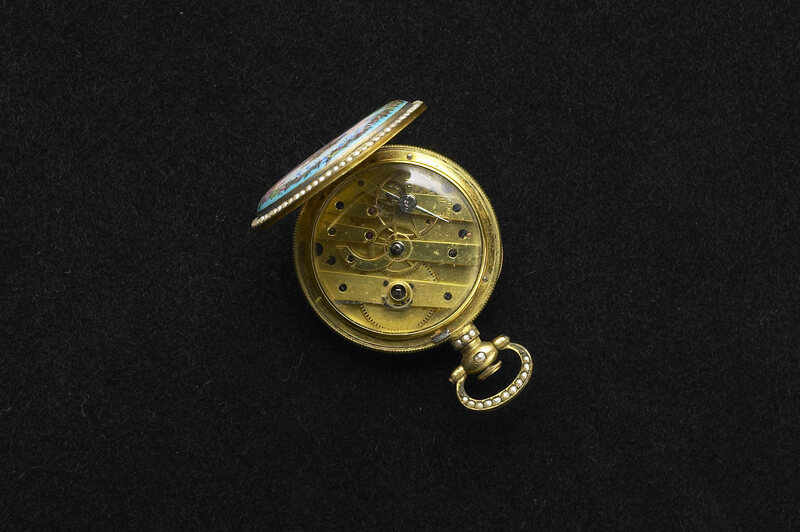 Pocket watches, with their intricate design and wearable nature, became not only a convenient instrument for telling the time, but also a status symbol and precious collectable. These two pocket watches, decorated with painted enamel and inset with pearls, are paired watches with symmetrical imagery. Atop the round watch face, a U-shaped ring inlaid with pearls is attached, thus enabling the watch to be attached to a string or ribbon and worn. 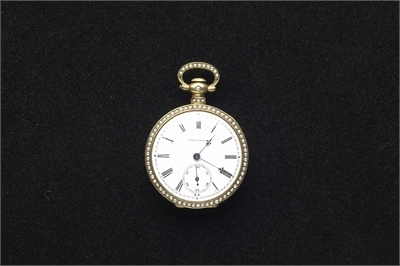 The watch face is made of white enamel, with two sets of Roman numerals and three hands. 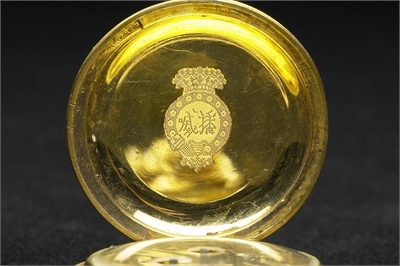 On the inner side of the watch case, a circular crown marking can be found, within which the Chinese characters “Bo Wei” spell out the Chinese translation for “Bovet”, the Swiss family of luxury watchmakers. 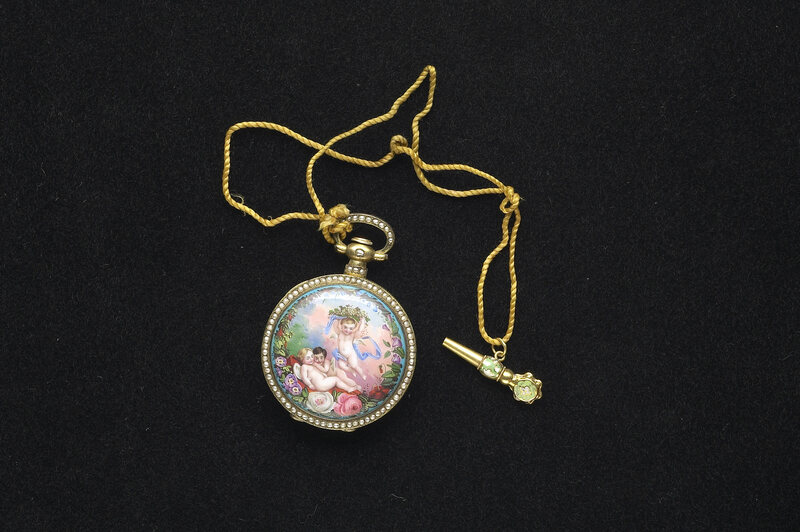 Renowned for their exquisite enamel watches destined for the Oriental market, the Bovet company was one of the earliest European watchmakers to establish a presence in the Chinese market, setting up a company in Guangzhou during the first half of the 19th century. 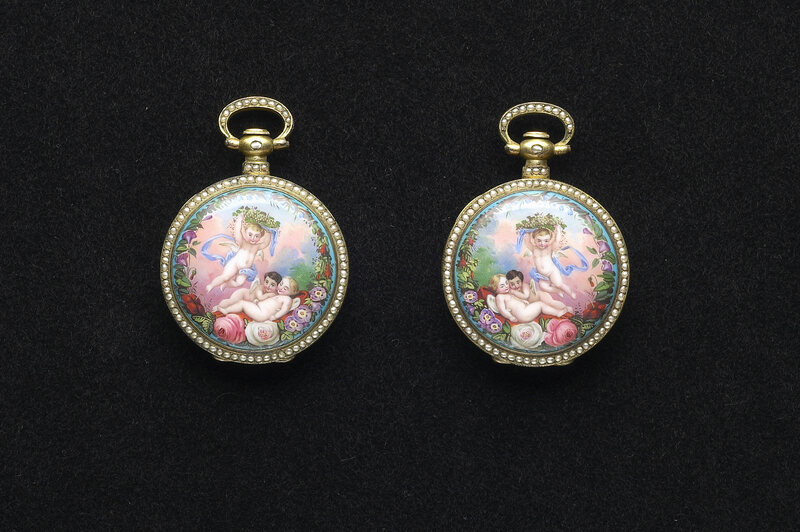 The enamel imagery of this pair of pocket watches centers on three adorable cupids, one of which holds aloft in both hands a floral basket overflowing with fruit, while a sash weaves around his body and drapes from the sky, while the other two sit nestled against each other. 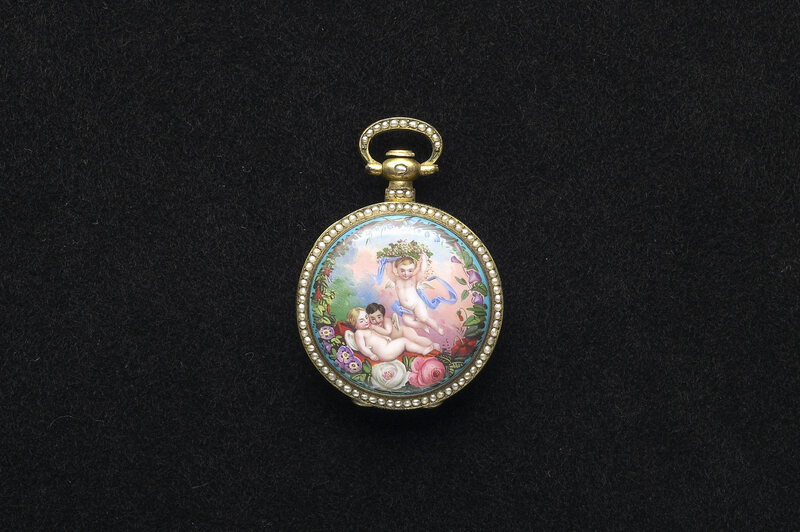 The cupids are surrounded by red and white roses in full bloom, as well as other vividly depicted flowers of many forms and hues. Wash techniques are employed to give an air of soft beauty to the clouds and sky in the background, and the rich light and dark contrasts lend a three-dimensional effect to the hair and skin of the cupids, as well as the surrounding flowers and leaves. The facial features of the cupids are somewhat different from the deep-set eyes and high noses of western babies, suggesting that this pair of pocket watches differs from the traditional European flower and figure enamel imagery and techniques, and was probably designed and manufactured exclusively for the Chinese market of the late Qing era.